The old saying goes, "Good things come in small packages." While that saying may or may not apply to some things, it certainly applies to the Roland Micro Cube GX Ultra Compact Combo Guitar Amplifier. 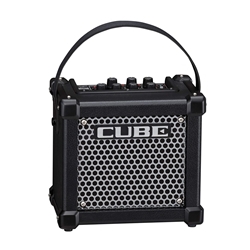 This small-but-mighty, amp is the most popular battery-powered amp of all time and packs a huge sound. It comes with 8 COSM amp tones and 8 DSP effects, including heavy octane effects for those thick, ultra-low tones. When you pair this combo amp with the Free Cube Jam app, you can play songs, playback music and record Micro Cube GX's COSM amp tones. Best of all, this amp doesn't need a cord and runs on batteries. Get the big time sound that your guitar needs, in a compact size, courtesy of this Roland combo guitar amp.